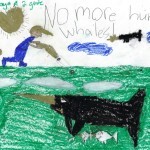 Send children's art to Color-a-Smile instead of the recycle bin! This wonderful, nonprofit organization accepts all standard-sized kids drawings and sends them on to nursing homes, meals-on-wheels recipients, hospitals, and other individuals in need of a smile. Even when you're doing your best to keep things simple, family life can be full at best. Often it's downright frazzled and unruly. To help your family make room for kindness, Doing Good Together™ has created a unique Family Meeting Agenda designed to unfrazzle family life. Enjoy our NEW printable summer bucket list, along with several tips to make the most of your family's free time this summer. Whenever you’re feeling disconnected and need a meaningful, simple way to do good together, revisit this list and get going. Because it is good for your family, our community, and everyone’s future, rejuvenate – or begin- your family's kindness practice today. It's that time of year again. My family, like so many of yours, is once again engulfed in all of the excitement, nervous planning, and - yes- shopping that goes along with a new class schedule. If' you're looking for big-hearted conversation starters, book ideas, and really great tips to add a "giving" aspect to your back-to-school rituals check out the Doing Good Together newsletter. My family has been enjoying the book Those Shoes by Maribeth Boelts, which is this month's book club pick for Big-Hearted Families. Those Shoes is exactly the type of story we hunt for here at Big-Hearted Families. It is a book full of thought-provoking ideas and real-life challenges. It’s also a beautifully written, heart-warming story that your family will want to pick up again and again. My five-year-old has been asking for it at every story time lately. > Recognizing the difference between what we want and what we need is not always easy, for kids or adults. > We all have something valuable to give, no matter how much or how little we have. > Being generous is rewarding, but it can also be difficult. There are still a few copies available over at our shop, if you want to bring this wonderful book - along with the recipe and activity - home for your family. I found the clothing drive particularly helpful. Not only did the story and the conversation inspire my girls to clear out the clutter of beautiful but rarely worn clothes in the back of their closet, but it got them talking to their friends about "gently worn" or even new donations. We'll be making our drop off on Monday -three large bags full of barely worn children's clothes and shoes. Plus, as we school shop for ourselves, we're working hard to identify "need" versus "want," in an effort to avoid cluttering up the closets once again with more than we can wear. Thankfully, my girls are young enough that they are as unconcerned as I am by brands and trends, so coveting the latest pair of .... whatever is trendy this fall... won't be a hurdle for us. I am hopeful that folding "giving" aspects into our back-to-school rituals will help make future years a little easier to manage, even after they become more socially aware. How are you making back-to-school season a time of giving and reflection with your family? Transform family night into a creative, fun, book-centered kindness practice! The book for March 2013 isAmos & Boris by William Steig. This epic story of friendship is simply spellbinding. It has its roots in Aesop’s classic fable of the lion and the mouse, though in Steig’s rendition the backdrop is a harrowing ocean adventure. Your family will discover how a tiny mouse can, in fact, come to the rescue of the whale he loves. How, you might ask? A little community organizing can solve almost any problem! Make change yourself with our little animal advocacy project. Plus, you’ll LOVE the wonderful recipe provided by our friends at The Kids Cook Monday and created by Cate of Tribecca Yummy Mummy. and created by Cate of Tribecca Yummy Mummy. Amos & Boris Animal Advocacy Project. Learn about your favorite endangered animal and advocate for them! Perhaps we can make spring happen through sheer force of will. Up here in Minnesota, the world is white as far as we can see. Little Miss 5 shook her head at it this morning, declaring "I will not be going outside again unless it's spring or fall or summer. I'm done with snow now." Are you also longing for the joys of spring? Or are you shaking your head at us northerners, wondering why we live way up here? Either way, here are three sweet and simple projects that will have you thinking spring and sharing kindness as a family, even if your weather isn't cooperating. Seeds for Change: Collect seeds to send to families who want to start their own gardens, thus providing a supply of fresh, nutritious produce. There's no better time to help people prepare to garden. Plant a Row for the Hungry: Designate the bounty from one row of your garden to donate to a local food shelf. Buy your seeds now, along with peat pots (or make pots from objects in your recycle bin), and start your seeds inside. Birdseed Cookies: Making a batch of bird treats is a fun way to care for your local bird population. Is it me, or have the birds been singing louder, longer, and more hopefully lately. Spring is in the air, and this is a great way to welcome it into full swing! The fall schedule is bursting into full swing, and the best tool I've found to make our family time meaningful is kindness. I'm not trying to be overly precious, or trite. Or predictably the Big-Hearted Families ambassador you all know I am. 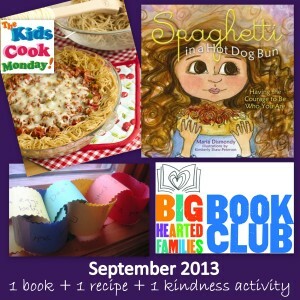 1) September Book Club fun:Spaghetti in a Hot Dog Bun has been a around in our home for a long time. It was fun to dig it out as part of the September book club. This book lends itself to rich discussion, especially at the start of the school year. Plus, the activity for this month, creating a kindness chain, has made each evening special. The kids are sharing many small moments of their school day that they might not otherwise bring up, and even us grown ups are sharing more with the kids than usual. It's been a great way to connect. 2) Take and Bake: A few of our new neighbors have had some major life events recently. Baking bread or muffins and gathering a few garden goodies to share has been a great way to get to know our community a little better, share a little homemade, homegrown love, and spend some messy time in the kitchen as a family. 3. Upcycling. Check out our new Pinterest board, Kids Can Up-cycle. In preparation for next month's book club activity, we've been exploring way to reuse t-shirts, and talking about the importance of keeping everything we can out of the landfill. This has sparked a lot of creativity, and a few notable improvements in our home recycling system. Even when it seems there is no time for a BHF project, keep in mind that small kindness activities like these can be part of the regular schedule and make family time both joyful and meaningful.